Named after the largest tree on the planet, the Sequoia is a giant stove. It has a 3.6 cu. ft. firebox and is capable of heating homes up to 3,500 sq. ft. 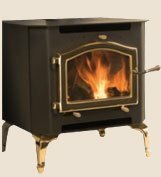 It has an efficient tunnel design catalytic combustion burn system, and at 2.2 grams/hour average emissions, it's also one of the cleanest stoves on the planet.